Our migration to Unity 5 is done! There were a few bugs that snuck past in the migration over the weekend that we tidied up, and we’ll be sure to fix any more that might spring up later. This build is now on the live branch, so for those that were being super helpful and giving it a go on the beta branch over the weekend, feel free to switch over to the normal build. Thanks so much to those that give the beta a spin this weekend! Fixed audio clipping bug that would cause some background elements to go mute. Fixed a crashing bug in the event UI if the player tried to take the damage in some scenarios. Fixed a crashing bug involving crises expiring that would hang up online games. Typically we have a long list of changes in our weekly builds, but this week we’ve spent most of our time planning and info gathering for some pretty large upcoming updates. So not a ton of time for bug fixes or feature adds this week, but we’ll be making up for that soon! Reviewing the stats for our Dragon Sweat achievement, it looks like only 0.2% of you have been able to conquer that behemoth. A hint: at the start of the game, you’re going to want to focus everyone’s attention on helping the engie. The sooner he can overcome your draw pod situation, the better. As usual, we’ll be streaming our own playtest this afternoon at 2:30pm ET on Twitch, and giving away a few free copies of SFT. Stop by an ask us anything! Fixed a bug where the damage output displayed on time fluctuation events were showing the incorrect amount. 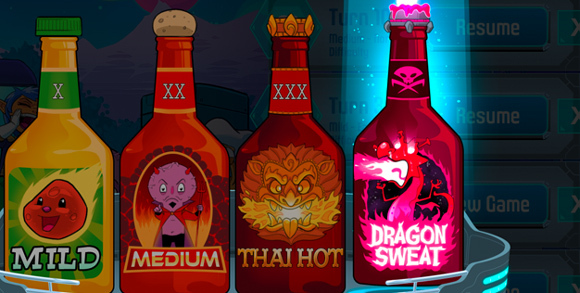 Our first content update has just arrived for Space Food Truck, spicing things up with the new Dragon Sweat difficulty. If you played our Dragon Sweat beta over the weekend, you may want to right-click SFT in your games library, click properties, go to the betas tab, and opt out of betas now. Rather than piling on the damage and calling it a day, Dragon Sweat adds a unique event on the first turn of the game designed to change the way you approach certain decisions. A manufacturer’s recall on your ship’s engine states it will rupture in “just about exactly 90 turns”, and any spacetime fluctuations you encounter on your adventure can reduce that timer. Your entire crew will need to bring their A game if you’re hoping to bring home the new “Dragon Slayer” achievements. Added 2 new achievements for beating Dragon Sweat. 10 customer reviews were added to the game over screen. Added a saucy new difficulty UI screen. Fixed a bug for save files that would get corrupted when illegal hands would be drawn. They should now be recoverable. Fixed a bug where “Full House” achievement wouldn’t trigger when using power glove. Fixed a bug where players could get around the hand max in various ways causing issues with game stability. In some cases, like fast track, if you’re researching and there’s no room, the card will go to the top of the draw pile instead. And we aren’t finished with Space Food Truck yet! Stay tuned for news on what’s next, and let us know what you’d like to see in the comments or on our discussion board. We were informed today by President Obama that April Fools will not be observed this year. 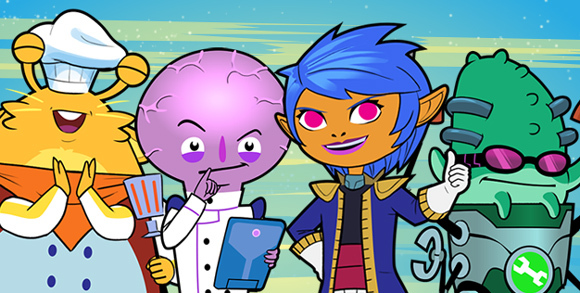 Today at 4pm ET Space Food Truck will officially leave Early Access to become our first Steam release! Feels like a good time to thank all of our early adopters again for their patience and their feedback, which was tremendously helpful in getting the game this polished and balanced. It really wouldn’t be the same game without you guys. I should also mention we’re launching at 10% off for the first week only! That means you can still get our discounted Early Access price for a little while longer. There may be a slight lag between SFT leaving Early Access and our discount being applied, so try back a little later if you aren’t seeing the 10% off. 25 lucky mailing list subscribers have been sent their free SFT Steam keys, but we still have more keys to give away during our Twitch stream today at 2:30pm ET. Stop by to check out the game in action, ask us anything, and maybe get a free key. After months of improvements in Early Access, our cooperative card adventure Space Food Truck is finally ready for a real release date: March 25. This new-and-improved launch trailer shows off some of the progress we’ve made, though it really doesn’t do justice to all the stuff we changed. Just scroll down the last few weeks of blog posts and look at those lists. Lists on lists on lists. We didn’t know what to expect when we started our first Early Access, but we really couldn’t have have gotten the game to this level of polish without you guys. Your feedback and game data (if you volunteered it) helped guide our decision-making as we tweaked the characters’ jobs, balanced the item decks, added new difficulties, and tightened up our user interactions. Thanks for jumping aboard early and pitching in! If you haven’t picked up a copy of Space Food Truck Early Access (which will update to the full version of the game), you might want to sign up for our mailing list. We’re giving away free copies of SFT on release day to 25 lucky subscribers! 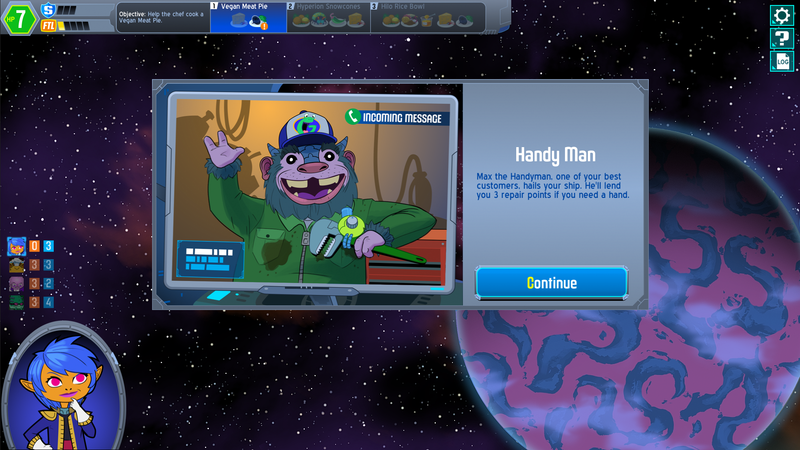 In today’s possibly-very-special update to Space Food Truck, we have for you what is called a “release candidate”. That means if nothing major is broken, this will be the official 1.0 version of the game! There are still tons of features and even new gametypes we’d like to try out if things go well after launch, but what we have at the moment is a great representation of what we originally set out to make: a goofy, sometimes brutal, sometimes hilarious space romp for you and some friends. So definitely install this version, take it for a spin, and let us know what’s working or not working for you! Email your feedback to bugs at spacefoodtruck.com, or start up a discussion on our Steam board. We’ve come a long way thanks to your willingness to play our work-in-progress, so thank you all for helping us get SFT where it is today. Recipes must now be delivered in order, so that the ending makes sense and so people’s food doesn’t get cold. Added a tutorial pop-up for first timers. If a rare ingredient is in your resupply, you can’t continue without claiming it. Added timeouts for joining the game in various online scenarios. Added an error message for trying to buy a card outside of the purchase phase. Mutate instructions dynamically update cost when mutating cards. Added plenty of new sound effects for various card abilities. Added SFX for ejecting cards from loot screen. Updated wording on Gamma Toaster. Fixed placement of the log window for non-1080p resolutions. Fixed a crash bug involving playing exchangitron repeatedly. Fixed rendering overlap issues with draw pods and card hands. Fixed a bug where pirates wouldn’t steal cards. Fixed bug where gamma toasting a Vexyl would increase it’s negative value to -2. Fixed bug where inventory would load the wrong screen in co-op games for spectating players. Fixed online bug where games could de-sync if players all readied up at very different times. Fixed Vexyl image on cards to be rounded. Space Food Truck continues to be polished and purged of bugs this week. There was even some discussion of possible March release dates today! That announcement is coming soon. You can check our Twitch stream from earlier today below, where Alex and I gave away a free copy of Space Food Truck every time our ship took HP damage. Was today the day we finally conquered Thai Hot on camera? And if not, was it totally Alex’s fault? You’ll have to watch to find out! Gamma Toasting a card multiple times will now correctly stack. Breakthrough now correctly reduces the lab costs to their minimum starting value, even if it could only reduce the cost by 1. “Destroy Nothing” button is now disabled upon selecting a card during Burnilizer. Moving to your room via job cards now shows correct error message when the Terrifying Monster blocks your path. Inventory screen now follows what the player is looking at when you are in ‘watch’ mode online. Updated game log icon to be more representative of its function. Added sounds for the Terrifying Monster that Lives in Our Vents. Audio that plays in the ship view no longer bleeds into other scenes (no more character chatter while in flight or in galaxy view). Fixed a dimming bug with crises and the diplomabot. Fixed a few bugs involving combinations of the Flux Inverter and Gamma Toaster. Fixed potential bug in the Give Card UI that would cause hang ups. Fixed a visual bug with cards bursting into green flames. Fixed bug where clicking on pods was disabled in online games during other players’ turns. Fixed a bug where online games would de-sync after 20ish turns in loot screen and hang up. Fixed card item text being cut off. Fixed bug where Mimicube would display the card it’s currently mimicking when rolled over in the lab. Fixed visual bug with Captain’s Orders while dragging characters. Fixed button labeling issue for some screens in co-op games. Looking at the list of changes for today’s update to Space Food Truck, I think Alex must’ve been on a week-long Monster binge. Our terrifying alien is animated, and lots of long-awaited tweaks have been tweaked as we continue our march toward a final version next month (Pun intended! Next month is March). We’ll be livestreaming a playtest of this build at 2:30pm EST today on our Twitch channel, so stop in and ask us anything! We’ll be posting the video to our YouTube afterward if you miss it. You can now undo the follow abilities in most situations: Backtrack, Cook, Discard Dive, Flambe, Free Sample, Research, Foresight, Breakthrough, Fast Track, Trusty Wrench, Duct Tape, and Claw. Added an icon for players with broken draw pods on the ship. The Draw Pod next to your hand now looks broken if it is. You can now back out of the ZapMart purchase phase if you haven’t bought a card. Vexyl cards display -1 Worth, to help clarify their effect on your total Worth. Added animations for the Terrifying Monster That Lives in Our Vents. Minor color tweaks to recipe HUD. Added new text for exotic ingredients found on planets. Added music to the victory screen. Added SFX for burnilizer card selection. Added SFX for flambe selection. Improved font rendering on cards. Added a minor tool tip for new players during the Purchase Phase. Life Support and Invasions now trigger mini-explosion animations to clarify where damage is coming from. Improved notifications for science lab events. Improved mouse/card collision detection for hand. Fixed bug in Captain’s Orders where UI would get stuck. Fixed bug where doing 2 Gamma Toasts back-to-back would hang up UI. Fixed bug where 2 cards being destroyed at turn’s end via Gamma Toast would stack. Fixed mouse over issues around draw pods and hands. Fixed potential bug with Crisis showing up and causing an error. Fixed bug where invasion icons would disappear. Fixed bug where ZapMart would be slightly offscreen after HP damage. Fixed bug where hands would get stuck onscreen during game over. Gameplay-wise the biggest change this week is that the resupply deck doesn’t run out late game. It was a slightly slower week regarding bug fixes and gameplay balance/improvements as we shifted focus to polish up some artwork, animations, and audio. SFT is still in Early Access, and we intend to start wrapping things up in the next several weeks to get ready for 1.0 launch. So if you’ve got bugs, suggestions, or feedback don’t hesitate to leave a comment, tweet at us, post on SFT forums, or send it directly to bugs at spacefoodtruck dot com. Resupply deck is now endless. Last Resort changed to “Leftovers”, along with new card art. Added polish to backgrounds of ship view and zap mart. Added animation for gamma toasting cards. Added animation for cards that will be destroyed instead of discarded. Fixed a bug where backtracking towards a delivery would cause two delivery screens to show up. Fixed bug where breakthroughs on Thai Hot could be reduced back to 1 instead of the minimum of 2. Asking around on an already revealed or visited planet no longer wastes an Ask Around point. Fixed a bug where recipe HUD wouldn’t update ownership HUDs when an ingredient was given to another player.